What "divine flower" offers both beauty and scent? Dianthus is the Greek name for the clove-scented “divine flower” more often known as “pinks.” Those of you who have used pinking shears in sewing probably can guess that the blooms got their common name from the serrated edges of their petals. By way of contrast, their foliage tends to be smooth and grass-like, often with a blue or gray cast to its green. 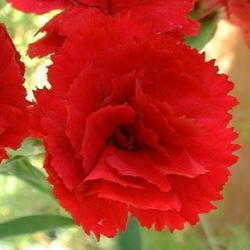 There are at least 300 species of dianthus worldwide, but only a half dozen or so are much grown in gardens. Those include Sweet William (Dianthus barbatus), carnation or clove pink (Dianthus caryophyllus), China or Chinese pink (Dianthus chinensis), maiden pink (Dianthus deltoides), cheddar pink (Dianthus gratianopolitanus), and garden or cottage pink (Dianthus plumarius). Although most are perennials in USDA zones 3 and higher, Sweet William is a biennial and the Chinese pink—hardy only in USDA zones 6-10—commonly is grown as an annual. I included the ‘Black and White Minstrels’ cultivar of the latter, pictured in the photo above, in a grow-bag with other annuals last year. Because the carnation has proved to be difficult in my zone 5, I suspect that it too may fare better in warmer climates. However, I did manage to keep the dusky red heirloom Dianthus caryophyllus ‘King of the Blacks’ alive for at least a couple years before it died out. 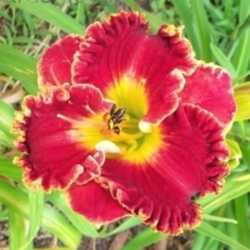 That could be due to our less than well-drained ground, since pinks prefer light and somewhat alkaline soil in full sun. However, the old-fashioned Sweet William, with its heads of intricately marked blooms like those above, generally does well here. In fact, I once found a small patch of those flowers growing where an old house had stood, implying that they must have been sowing themselves down for generations. I also have a tough little mat-former (pictured below) with small pink flowers whose identity I’ve lost track of. 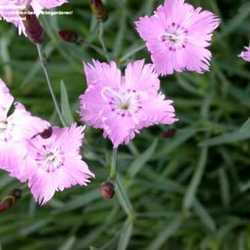 It probably is either a maiden pink or cheddar pink cultivar and blooms profusely in early summer. That latter name refers to the limestone-rich Cheddar Gorge in England, which apparently is both "chalk and cheese" and suits dianthus down to the ground! The fringe-y white flower in the banner flourished in its second year here before bowing out in its third. Since it was part of a dianthus mix, I never knew its identity for sure, but concluded it probably was sand pink (Dianthus arenarius). Deeply cut dianthus types like it recently have become more widely available, so I started seeds from a Dianthus superbus mix last spring and will sow Dianthus superbus ‘Spooky’ this year. Dianthus isensis ‘Dancing Geisha’ also offers that unusual shredded and/or bearded look. Fortunately, pinks are among the easiest plants to germinate. If you barely cover the seeds with your damp seed-starting mix and keep them under somewhat cool conditions, they can sprout in 3 days or so. Even if you don't have the right conditions in which to grow carnations, you need feel little guilt about grabbing a bouquet of them off the supermarket carousel instead--since they are among the longest lasting and most economical bouquet flowers available. We sometimes plant supposedly annual dianthus types on graves at Memorial Day only to have many of them return the following year. Despite their frilly blooms, they are gritty little plants. So it doesn’t take much care to keep them in the pink! Photos: All of the photos in the article are my own. Audrey is the author of the Thyme Will Tell mystery series from WaterBrook Press (Random House) and an e-book of humorous rural romances titled Love and Other Lunacies. In addition to digging up plots--both garden variety and novel--the former Master Gardener writes free articles on plant history and folklore for her Thyme Will Tell site and posts her photos at GardenPhotographs.net . Audrey also designs hay-seedy stuff and nonsense for her Rustic Ramblings Zazzle store, and indulges in mystery novels, apologetics, cryptic crosswords, old lace, beads, and Border Collies. Follow her on Google.